Angel acid protease catalyzes amide (peptide) bond hydrolysis in protein or peptide substrates. It is widely used in brewery and manufacture of alcohol, food processing, feed additives, leather processing, etc. Effects: eliminate the anti-nutritional factor, and increase the utilization of feedstuff. 1. Levels: in alcohol fermentation from corn, the amount of enzyme used usually ranges between 10-16 activity units per gram of ingredient, depending on ingredients and other considerations. An example would be if 14 activity units per gram ingredient is chosen, then for each ton of ingredient, 280 g of 50000 U/g Acid Protease would be used. 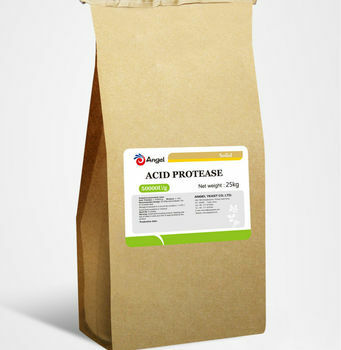 If 40000 U/g of Acid Protease is used, then 350 g should be needed. In food and feed, the amount used will depend on the specific need of the client and should be adjusted accordingly, with a suggestion of 5-10 U/g ingredient to begin with. For soy sauce production, the suggested rate is 25 U/g ingredient, and for beer, 5 U/g ingredient is suggested. d) Yeast production through fermentation of solid or production of single cell protein feed: After heating, cool the ingredients to 30°C. Add 20 units of Acid Protease per gram of ingredient to lukewarm water, after dissolving, add yeast strain and mix well into batch of ingredients and ferment.